Approach driving in a new country with extreme caution. Mostly importantly, always be aware of your position on the road. Most European countries drive on the right-hand side of the road, whilst in the UK, cars travel on the left. Keep this mind when negotiating roundabouts. Invest in a good Sat Nav and/or Maps if you haven't already, and don't forget to download the most up-to-date maps to your SAT NAV to limit the chance of travelling up roads to nowhere. Keep your eyes peeled for road signs and traffic lights. Road signs may look the same across Europe but there are slight differences between countries, so don't allow this to throw you off. Pay attention to the speed limit. In Italy for instance fines are particularly heavy for speeding offences. Each country speed limit will differ slightly but the standard speed limits across Europe are 50km/h for built-up areas, 90km/h for outside built-up areas on ordinary roads, 110km/h on dual carriageways and 130km/h on motorways. When out on the road, make sure you keep your driving license with you, along with a International driving permit (IDP). Be sure to have the relevant insurance and breakdown cover in place too. Check with your motor insurer to make sure you have the cover you expect when driving abroad. Park your car and use public transportation or taxis rather than face driving in an unfamiliar city centre. For ease and to save yourself time use motorways. You may encounter toll roads on your motorway travels. Several European countries, like Switzerland and the Czech Republic, will require you to buy a special sticker or vignette to drive on motorways, which can be affixed to the car's front window and is valid for a certain amount of time. Failure to display a valid vignette can result in a fine. If you do decide to take on driving in the city centre, try to avoid heavy traffic times and most of all, stay calm. If you find yourself boiling over with frustration, resist the temptation to sound your horn. In urban areas in Spain it is prohibited to sound the horn at any time, except in an emergency. Lights may be flashed in place of using the horn. On mainland Europe, it is compulsory for all vehicles with more than two wheels to display a warning triangle. Drivers must also store a reflective jacket in the car and not in the boot (it must be worn when exiting the vehicle so therefore must be kept within the car), which has to be worn in the event of a breakdown or emergency outside a built up area on all roads. Some other countries will require you to carry a First-aid kit as well as a set of replacement bulbs and fuses. Driving in unfamiliar areas and concentrating on road signs can be exhausting. Be wise and pull up in a safe place to rest if you are feeling tired. Don't forget basic safety. Ensure everyone is wearing their seatbelt, including you. Try not to get distracted by your SAT NAV whilst navigating your way around and resist the temptation to talk on your mobile whilst at the wheel. 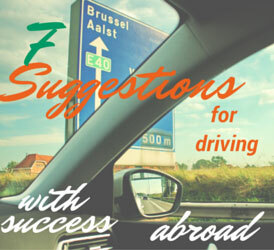 What's your opinion on driving in a new country? Do you love it or loathe it? Let us know your thoughts by sharing your comments on our Facebook page.